Caudon® Amphibian Fencing has been designed to provide superior quality barrier fencing systems. Caudon® Amphibian Fencing has been designed to provide superior quality barrier fencing systems to prevent the movement of amphibians and reptiles, contain them within a receptor area, or to facilitate trapping & collection. We have chosen the best materials for our fencing products to provide robust amphibian fencing systems to provide protection for great crested newts and other amphibians or reptiles. All plastic materials are UV stabilised to help protect against degradation due to sun exposure and where possible are manufactured from post-consumer or recycled material. Four levels of amphibian protection are provided by our Caudon® Amphibian Fencing systems to offer the best and most economical products for your project, depending on longevity in the ground, budget constraints and its likely exposure to damage from site traffic or vandalism. All of these systems are suitable for mitigation of Great Crested Newts, Smooth Newts, Common Lizards, Slow Worms, Adders, Common Toads, Natter Jack Toads. For mitigation involving Grass snakes, we would recommend using one of our Caudon® Grass Snake Fencing systems. All work is carried out subject to consultation with ecologists and guidelines recommended by Natural England. 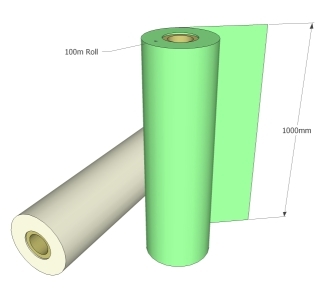 Caudon® Temporary Amphibian/Reptile Fencing consists of 100m rolls of heavy duty UV stabilised polythene. This material is suitable for installation for up to 2 years. 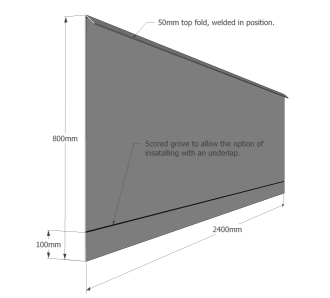 The height of the material is sufficient to allow the installer to create a 'roll' of material at the top of the fence, forming a top fold, preventing species from breeching the fence over the top. Caudon® Semi-permanent Amphibian/Reptile Fencing is manufactured from tough 1mm thick recycled HPDE and is very resistant to damage from site or human traffic, or vandalism. It is UV stabilised for up to 5 years and offers an economical but long lasting wildlife fencing solution. Caudon® Permanent Amphibian/Reptile Fencing is manufactured from tough 4mm thick recycled HPDE. This provides a wildlife fencing panel that is extremely tough and is highly resistant to damage from site traffic, human traffic or vandalism. 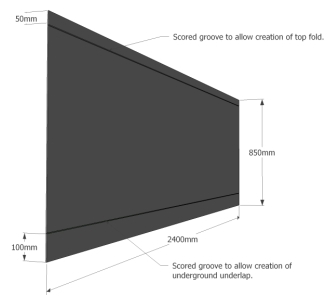 It is UV stabilised for up to 15 years and offers a highly robust mitigation fence for amphibians or reptiles. Caudon® Permanent Steel Amphibian/Reptile Fencing offers the very highest level of protection in terms of reptile and amphibian mitigation fencing. 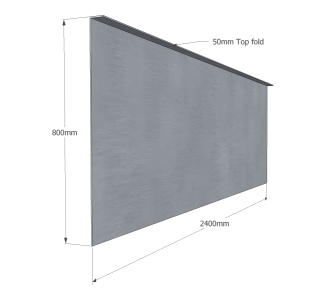 Manufactured from 1.5mm thick galvanised steel panels offering 20 years plus installation and one that is extremely resistant to vandalism or site traffic damage.